Most wedding proposal stories begin and end the same. The anxious boy is eagerly rehearsing the special words drawn up in his head, while the unsuspecting girl sits ideally by until releasing a squeal of delight and confirmation once the ring is placed on her finger. While that may be the case for some couples, at Gottlieb & Sons we understand that not all couples are alike and some make a point to take the extra step to ensure that their proposals are one of a kind. Take a look at our favorite tech savvy wedding proposals that made it into our hall of fame. Couples seem to be using all different kind of avenues to pop the question. Mashable posted one of the most unique proposals we've seen using Twitter and the Old Spice Guy. A fan named Johannes S. Beals tweeted, “Can U Ask my girlfriend to marry me? Her name is Angela A. Hutt-Chamberlin” to Old Spice. The following video popped up on YouTube within an hour, and Old Spice tweeted it at Beals. The fan tweeted within hours that she’d agreed to marry him. Google employee Michael Weiss-Malik wasn’t satisfied with his proposal 1.0 (“simple heart-felt words exchanged during a quiet night at home”), so the 2.0 version took advantage of Google’s Street View pass near the Google offices. Sadly, it has now been replaced with updated imagery, but the memory lives on. One lucky girl found the deal of a lifetime on Groupon, the online shopping site. 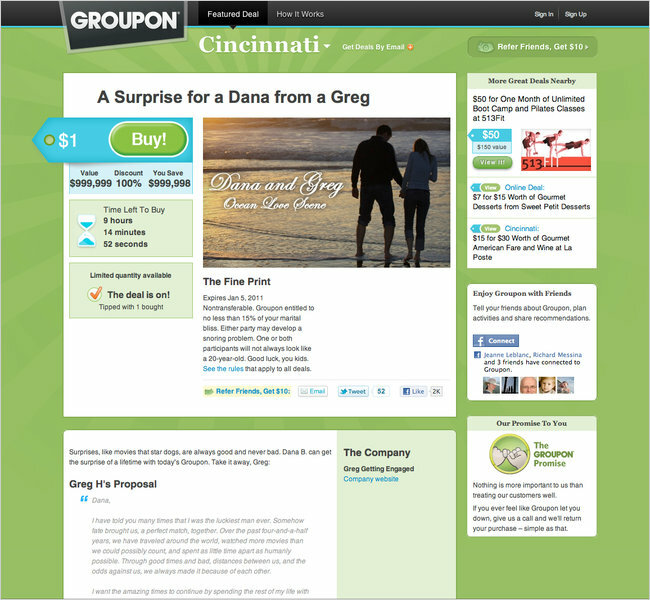 Dana, a Cincinnati Groupon fanatic, received a special surprise when she logged to purse the daily shopping deals. The deal of the day for her was a marriage proposal from the now fiancé Greg, who contacted Groupon staff directly to make the proposal happen.